What can you do with a Biochemistry degree? A Biochemistry degree opens many opportunities for you! You can attend medical school, dental school, graduate school, law school or work in a lab. See our careers page for more information. I’m interested in being a pharmacist. Should I study biochemistry? Yes, but we recommend you complete the Biochemistry, Pre-Pharmacy degree plan. It was created for students planning to attend pharmacy school upon graduation. Why are there two degree plans listed? In Fall 2013 we made several small revisions to the degree plan to help make the degree more flexible for our students. Generally speaking you graduate under the catalog you matriculated under. Speak to your advisor for details. Who can I ask for more information? 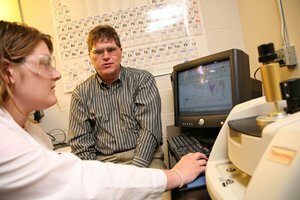 Contact Dr. Prilliman, Chair of Chemistry, sgprilliman@okcu.edu.